Instructions: Create a 4.25" x 5.5" tent fold card base from white card stock. Locate premade card panel on sample in Cherry Blossom Retreat Paper Collection. Trim to fit card base. Using the mid-size oval from the Eyelet Oval & Basics Large Die, die cut an oval into the center of the card panel. Ink all edges and inner oval using Stack and Store Dauber and Ranger Archival Ink - Forget-Me-Not. Die cut the doily shape from the Butterfly Kisses Decorative Die. Trim in half. Using a piece of hydra sponge and Designer Dries Clear Adhesive, apply adhesive to accents and sprinkle with Rajni Chawla's Crystal Clear. Adhere to backside of card panel along sides of oval opening as a decorative background accent. Adhere card panel to card base. Stamp birdhouse image, sentiment sign and one tree branch from the Cherry Blossom Retreat Cling Stamp Set onto white water color paper using Ranger Archival Ink - Jet Black. Color using Zig markers. Die cut with coordinating dies from the Cherry Blossom Retreat Die. Using foam tape, adhere birdhouse and sentiment sign to card front as shown. Stamp one inking of each size cherry blossom from the Tweet Cherry Blossom Cling Stamp Set onto white card stock using Memento Dye Ink - Rhubarb Stalk. Color centers using Stack and Store Dauber and ColorBox Chalk Ink - Rouge. Die cut using coordinating dies. Ink outer petals using ColorBox Chalk Ink - Rouge and Stack and Store Daubers. 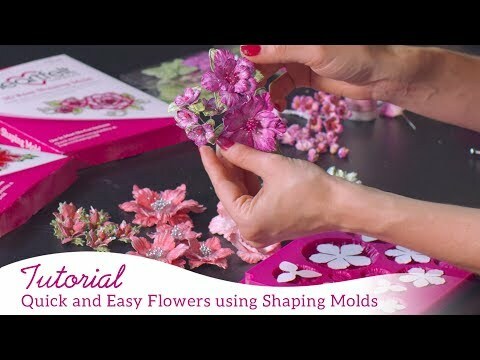 Layer into 3D Cherry Blossom Shaping Mold. Stamp one inking of foliage from Tweet Cherry Blossom Cling Stamp Set onto white card stock using Ranger Archival Ink - Olive. Using Stack and Store Dauber, color leaves using a combination of Ranger Archival Ink - Vivid Chartreuse and Leaf Green. Die cut using coordinating die and layer into 3D Cherry Blossom Shaping Mold. Stamp one inking of the tiny birds from the Tweet Cherry Blossom Cling Stamp Set onto white card stock using Ranger Archival Ink - Forget-Me-Not. Using Stack and Store Daubers, color using Ranger Archival Ink - Forget-Me-Not and ColorBox Chalk Ink - Rouge. Die cut using coordinating die and layer into 3D Cherry Blossom Shaping Mold. Spritz die cuts in 3D Cherry Blossom Shaping Mold slightly with water and pass mold through die cutting machine. Set flowers aside to dry. Using Deluxe Flower Shaping Kit, pierce flower centers. For large blossom, fold 3 non wired stamens in half and put through flower center. Secure from backside using hot glue. Repeat steps for mid-sized blossom using 2 non wired stamens folded in half, and 1 folded in half for smallest blossom. Once glue has set, trim off threads as close to base as possible. Trim leafy branch in half, shape slightly using Deluxe Flower Shaping Kit and adhere around bird house as seen on card sample. Adhere cherry blossoms to branch and near sentiment sign using hot glue. Adhere small bird to sentiment sign. Lastly, using fine metal tip and Designer Dries Clear Adhesive, glitter all cherry blossoms using Rajni Chawla's Crystal Clear, and all preprinted florals using Crystal Ultrafine Transparent Glitter.